I have this problem where I get an exception when I start coding and make use of the VA suggestion list. I'd like to get rid of this problem because it is rather annoying. This happens to every project that I open. I recently installed VA and I didn't have this problem before so I assume that it's VA. Any info on how to fix this problem? and find Visual Assist in your list of installed extensions. Now disable VA, which will require an IDE restart to fully do. Does this fix the problem? Based on your experience it probably will, but this will confirm if VA is a factor or not. If this does fix the problem, can you please try Enabling VA again, in the same dialog, and see if this makes any difference? Again this will require an IDE restart. Sometimes, when seeing an exception, simply disabling and enabling VA is enough to fix the problem. @feline I have enabled VA and then tried again, it didn't give an exception as expected. Then I Enabled VA again and it gave the same exception again. Another piece of information is that I only have the exception once per opened solution. So after closing the solution and opening it again I will get the exception again. I have never gotten it twice in the same solution load. This is a little unexpected. Normally when there is an exception, which you only get once after opening a solution, disabling and enabling VA fixes the problem. Obviously that is not happening here. and paste the details (from the clipboard) into your reply. This will give us the basic information about your setup. Do you have any other extensions installed, apart from the default ones that ship with the IDE? I am wondering if this could be a factor. before seeing the exception, and then trigger a listbox or two, do you still get the exception? 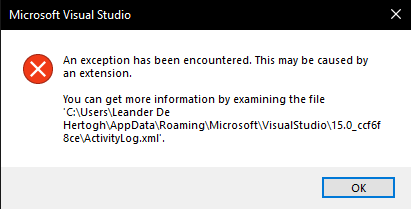 I am wondering if VA has to be installed and active, or just installed and loaded (not disabled in the extensions dialog) to trigger this exception. As for other extensions, I first had Resharper++ installed but I was discontent with the performance of the extension. So I bought VA and I was happy because performance was way better. I still had the Resharper++ installed, so I thought they maybe would've conflicted each other but it still gave the exception. I have the perforce extension as well but I never had any problems with that. I tried disabling this but that didn't work as well. I tried disabling VA via the drop down menu and it still gave me an exception. Thank you for the information. Nothing seems all that odd or unexpected here. First a quick sanity check, if you make a new, default C++ solution, do you still see the exception? It seems unlikely that the problem is solution specific, but not impossible. dialog and install VA from the online extension store. This will install VA into this separate profile. To reload the IDE into this profile, pass the same command line switch when you load the IDE. Do you still get the exception when testing in this new, default profile? If you don't then we know that somehow the problem is related to your profile. If you do then we know it is something about the machine its self. To return to your default profile just load the IDE normally, without any command line switches. So I made a new project and still got the exception. So I tried the command line VATest and installed VA then closed it again. I didn't have to choose what settings that I wanted to use though. So I don't know if that's normal but it looked like the default visual studio. After opening it again with the same command line, I made a new project and triggered the suggestion list without getting an exception. So this means that it is a profile problem right? Then what do I have to do? I expected you to be asked which colour scheme to use for the new profile, at least, but it looks like the test still told us something useful. and then import them into your test profile. Does this cause the exception to start happening? It shouldn't, but its best to double check. note the "15.0*" directory name is machine specific, but it should always start like this. The private registry file might have either name. Deleting it should reset your profile without to many side effects. When you now load the IDE VA should still be installed, but disabled, so you will need to go into the Extensions and Updates dialog and enable VA. Does this fix your default profile, and stop the exception from happening? I did everything and don't have the exception anymore! Thank you for the update, I am glad this is now fixed. It sounds like something in your IDE profile became corrupted, which is why you were seeing the exception. So hopefully this will now stay fixed.